Change Technology Inc. is a company that assists businesses and individuals in achieving their highest level of performance. We accomplish this by evaluating a department, branch or an entire company and determine their strengths and weaknesses. We then provide an extensive report outlining our findings and make recommendations for change. Where we differentiate ourselves from other companies is that we actually guide the implementation of the changes we recommend. Work Management: This area addresses how the team determines and manages the specific tasks and resources related to its role. Relationships: This area addresses feeling, attitudes and behavior that most reflect the group’s interpersonal relationships. Processes: This area addresses group processes such as meeting management, learning, creativity, participation and other areas. Leadership:	This area determines how the group leader functions to support and facilitate all aspects of the group process. These responses are scored and reported in a numerical and percentile ranking with separate reports showing the departments strengths and weaknesses in each area. All information provided by the employees from this report is done anonymously. 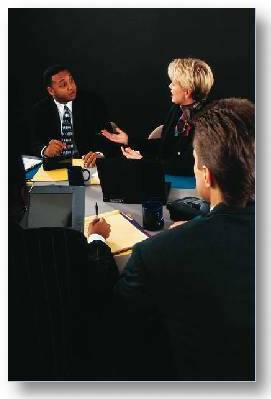 Managers do disclose their responses so we can compare their perception of how the department is doing against the employee’s perception. The importance of this is so we can determine if a manager is in tune with their employees. We spend approximately one hour interviewing each employee within the department to determine what they would like to see changed in their area. This interview is open and free flowing with following. Change Technology Inc. is non-threatening to the employees; thus their responses are more open and honest. These two sessions, usually lasting from two to four weeks, provide the bulk of the information for our report. We will also take into consideration any recent internal surveys in order to determine any positive or negative trends. When the evaluation results are reviewed with your Senior Management, we will have a list of recommendations for your approval. The next process is to implement the recommendations and this is done through and employee committee chosen from a cross section of the department. This process has proven very successful because we determine the priorities of the problems the employees have identified and guide them in making the changes. The employees, therefore, have a vested interest and ownership in what is taking place. The changes take place faster and with less resistance using this method. The normal time period for this phase is approximately three to six months. At the conclusion of our evaluation, we re-administer the original questionnaire in order to measure our work and quantify the changes that have taken place. You see the results in writing from your own people. The direct benefits to your company from our work are improved employee morale, increased production, improved on time and attendance rates, lower stress levels, higher self-esteem and lower employee turnover. All of these contribute to IMPROVED PROFITS. Additionally, during our evaluation we perform "Behavioral Evaluations" on the employees within the departments we are assigned. These reports provide management with guidelines for communicating with, motivating, managing and developing the individual. Our reports: (1) get new employees off to a fast and productive start by allowing managers to learn more about them in fifteen minutes than working with them for a year, (2) motivates present employees by using their personal wants and needs, (3) improve employee morale by helping the employees know that you care about them as people, (4) create a working climate that enables employees want to come to work and produce results, (5) build sound relationships between employees and management which increases mutual trust, respect and loyalty, and (6) reduce turnover and absenteeism and resulting cost in training, lost productivity and temporary replacement cost. We are currently completing an assignment on a department that the employees gave only a 58% approval rating on our initial evaluation. Upon completion of our work, the employees have moved to a 90% approval rating of their department. We can reduce your employee turnover rate and cost resulting in improved performance and increased profits. Change Technology Joins Directo, Enters National Paycard Arena. Directo, Inc. America’s largest paycard company, based in Atlanta, Georgia, have formed a strategic alliance allowing CTI to market Directo’s FDIC-insured paycards. Change Technology Inc. and the Garland Chamber of Commerce announce a new strategic alliance. © 2004 Change Technology Inc.